This is where I worship. On the pulpit there is an inscription, “It’s not about me”. It really is about the cross. WFR is a place where you have the absolute freedom to be you. No one needs to put on a front, you know, a “church face” to be accepted and loved. It’s a church that loves people where they are, like they are, with no promised expectation. This couple is an elder and his wife. They lead our Celebrate Recovery Ministry. Mac and Mary Owen are two of the reasons I love Whites Ferry Road church. 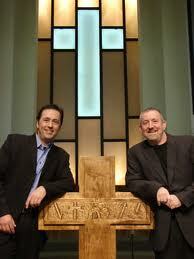 They are two ordinary people with an extraordinary passion for helping the down and out find Jesus and abundant life. The guy below is an elder too. 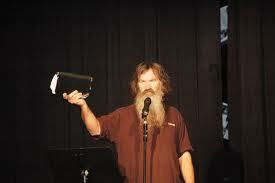 He is a famous duck hunter, duck call maker and has the number one show on the Outdoor Channel. He is also a guy with a passion to tell as many people as possible that “There is a way out of here alive” as he puts it when he preaches to thousands every year all across America and in foreign countries. Phil Robertson and Mac Owen are two unlikely characters God has chosen to use to get the good news about what Jesus has accomplished to helpless and hopeless sinners. Regular guys, passionate about Jesus, another couple of reasons I love where I worship. “Two preachers for the price of ….two”. We have two preachers, who are also elders. Alan Robertson and Mike Kellett share the pulpit, sometimes together, and sometimes alone, but always with simple, honest Bible messages. Grace focused, Christ honoring, preaching is what we get every Sunday. They think “ego” is a substitute for eggs at breakfast! Good, down to earth guys, who love the folks and love God. Well, I could go on for hours, I know and worship with scores of great people! Some as odd as home made soap, but most are sincere followers of Jesus who have learned to love deeply, forgive quickly, and enjoy being Christ’s child on the way to heaven. At WFR it is entirely possible to embrace our Restoration Movement roots without disliking other Christians who aren’t exactly like us. On a Sunday morning you will likely see dozens of people surround those who come forward to ask for prayer, confess some sin, to be baptized, or to share a victory. I think of our auditorium as “the family room”. WFR church is a place where you can be you, the real you, and you will not be rejected if the real you is a flawed, sometimes sinful, person. You will be loved, forgiven, encouraged, and hugged…over and over and over until the light of God’s amazing love comes on in your life. The stories of God’s redemption are legend. The reach of these usual people is unusual and world wide. Come by for a visit. If you don’t stay you’ll probably wish you could. It’s a grace place with few rules. Love God and love your neighbor and tell someone the good news. That’s about it. 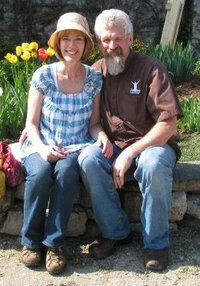 For ten years my wife and I have been loved and supported and have enjoyed one of the most unusual churches in America. 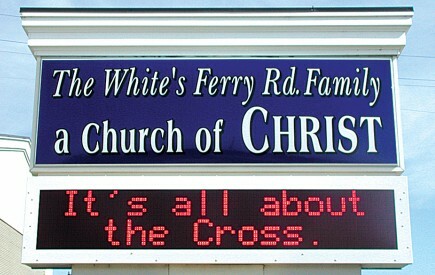 We are so blessed to worship at White’s Ferry Road Church of Christ. Great thoughts Royce…love those folks too! ROYCE, YOU DID SUCH A GREAT JOB ON THAT ARTICLE & NO TRUER WORDS CAN BE SPOKEN. I HAVE BEEN THERE NOW 15 MONTHS, AM A GREETER, & WOULDN’T TRADE IT FOR ANYTHING. I LOVE MY WFR FAMILY & DON’T KNOW WHAT I WOULD WITHOUT THEM. THEY OFFER SO MUCH WITH JESUS CHRIST LEADING THE WAY. LOVEEEEEEEEE IT. What an awesome tribute to your church family. Royce that was a fine write up. I help servie the lords supper every week that I can. I love WFR and the whole church family. I was baptised at WFR by Paul Stephens. It’s nice to know a preacher that loves football as much as I do. We’ll talk to you later Royce and once again great job.